January,2009 Sheng Long received a primtted from City of Long An to add additonal service to our product line. In May 2009, Sheng Long started builded a new Freezer Warehouse and completed in December 2009. Passed inspection and receiced business licence in Febrebary 2010. Freezer Warehouse has divided into 3 sections. 2 Large freezer warehouse have total 1,545 meter square and samll freezer warehouse has 340 metere square feet. Frezzer Warehouse can maxium store up to 8,000 tons of products. The loading douck can park 8 trucks at the same time. Cold storage use a brand new refrigeration system made in Japan. It operate in fully automatic temperature control system, and maintaining the temperature in between -23 degree Celsius(-9.4 degrees Fahrenheit) to -25 degrees Celsius(-13 degrees Fahrenhei) Warehouse also have a automatic emergency generators system as a power backup system. It will keep the freezer properly operate when power outage is occure. 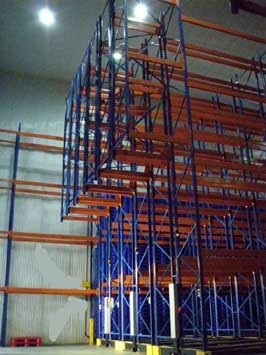 Cold storage Shelved System is using the newset mobile moving racking system made by West Germany. The facilities have the latest technologies incorporated with our ammonia refrigeration systems to manage shelfves productus items category. To achieve most efficiency , simple and 0 dead and out of the cargo. Our company is using the new international food hygiene standards of plastic pallets over common wood poallets. 24 hours loading / unloading service. Sheng Long Bio-Tech International Co, Ltd Copyright © 2010.